Home Elephant uses Facebook to organize your neighborhood like never before. Welcome to the neighborhood watch of the future, welcome to Home Elephant. Created to bring social media to local neighborhoods, Home Elephant lets you connect with people around you and share news, post alerts, or just chat. All for free. While it functions through Facebook, Home Elephant is also available as an iPhone/iPad or Android app. If you see a suspicious van parked down the street, alert your neighbors through Home Elephant and they’ll know about it whether they’re at home or the office. Throwing an impromptu BBQ? Send out a message and your neighbors could be moseying over to your backyard in no time. Check out some more great examples of how to use Home Elephant in their hilarious commercials below. 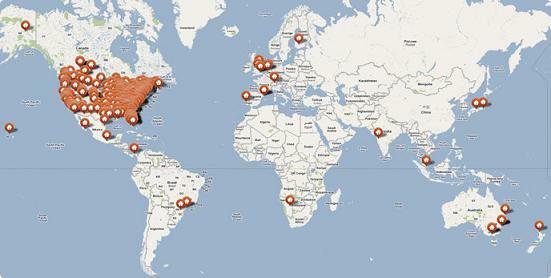 Only a few weeks old, Home Elephant’s beta site has already reached over 2400 neighborhoods around the world. This perky combination of social networking and old fashioned friendliness could be set for exponential growth. So far, Home Elephant has mainly focused on the most casual and light hearted of uses for its product. While they occasionally mention alerting your neighbor to a break in, or checking on an elder with health problems, they mostly focus on the petty annoyances (and joys) that characterize our neighborhoods. In the following commercials, Home Elephant demonstrates how it can be used to overcome the pranks of a very naughty dog. The commercials get the sentiment across, but maybe not the technicality, so let me clarify Home Elephant a little bit. You register on their site using your Facebook account (or through the smart phone apps). Then you start adding people to your My Neighborhood list (which involves a mutual approval process naturally). Soon there after your sharing info on a collective neighborhood wall, chatting with your new neighbors or sending out alerts to the group. Events can be shared via a community calendar and so on. It’s pretty much like the Facebook you already know, just optimized for this particular kind of geographically based exchange. Once a neighborhood’s adoption rate hits a critical mass, you can bet that no bad dog behavior will go unchallenged by the public notice board. In my mind, however, Home Elephant may be attracting users with tales of dog poop treachery, but the implications of their product are far greater. Geographically based groups that are Facebook-enabled to share information quickly and easily. That could be part of a successful strategy for everyone from the PTA to revolutionaries militias. Seriously. Whether you’re saying “Hey, anyone want some of this pie I baked, come over!” or “Hey, we’re being oppressed let’s meet on the corner on the way to the city-wide protest!” Home Elephant could help either way. As it’s free and runs off nigh-universally available services (Facebook and Google maps), Home Elephant is able to work its magic almost anywhere in the world that has internet. Which makes it a potentially very powerful concept. Here's the latest map of Home Elephant enabled neighborhoods. Not bad for a few weeks of being available. I’m no expert on mapping the growth of startups, but it looks like it took three weeks for the site to go from zero to 1000 neighborhoods (to get the number of users multiply by a factor of 3 or more I would think). Then, to go from 1000 to 2400 took a little less than two weeks. Pretty good expansion. Now, Home Elephant is getting attention throughout the web, its commercials, and on local and national news channels. Whether it’s the straight forward applications of dog-control or my more grandiose vision for geography based empowerment that are fueling this increase I can’t say, but things seem to be going well for Home Elephant in either case. Of course it’s too early to know if Home Elephant will ultimately prove a success, but even its early adoption is a sign that there is a lot of room in the social media application space to explore. Message systems optimized for use by neighborhoods is just the latest innovation. We’ve seen apps target scientists, gym enthusiasts, and other groups with social networks as well. There’s so much more here that could happen. There are thousands of developers working on apps for smart phone, Facebook, etc. It’s going to be really interesting to see what becomes the next hot idea.